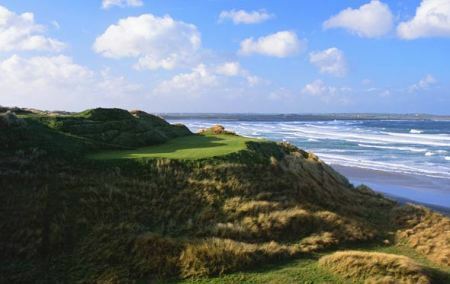 DoonbegBallybunion, Doonbeg and Lahinch are partnering once again this May to host the Great Irish Links Challenge. Last year in the inaugural staging of this event, more than 250 golfers played in the Challenge which despite some equally “challenging” weather was a huge success. This year the organisers are hoping to attract double last year’s numbers for the event, which will take place from 7-10 May. Last year the three courses were all voted in the World’s Top 100 Golf Courses as chosen by Golf World. This prompted them to join forces to create and host the inaugural “Great Irish Links Challenge”. LahinchAs in 2011 the event is for teams of four. There will be an overall team winner - The Great Irish Links Challenge Champions - which will be decided on the team’s performance over the three courses. There will also be daily prizes at each of the three courses. The event begins on Monday, 7 May with registration and a welcome reception at Doonbeg. It will conclude with dinner and an awards ceremony on Thursday evening, 10 May also at Doonbeg. The entry fee for this year’s “Great Irish Links Challenge” is €595 per person. The fee includes the welcome reception, golf at the three courses, daily transport to the three courses, prizes and the final dinner. It does not include flights or accommodation. Last year, the winning team came from the US and despite the tough weather conditions there were three holes-in-one, at the 8th and 16th at Lahinch and at the 9th in Doonbeg. Such was the severity of the conditions the ace in Doonbeg came courtesy of a driver! Full details can be found on the website www.greatirishlinkschallenge.com or by phoning +353 65 9055602.